In keeping with an annual holiday tradition, Pioneer Waterproofing employees assembled 260 bicycles for a local toy drive. Even though Mike Crawford is in his late 50s, he still remembers his first bike. It was a Schwinn with a gold seat and "banana-style" handlebars. "It was the coolest bike ever," Crawford said. 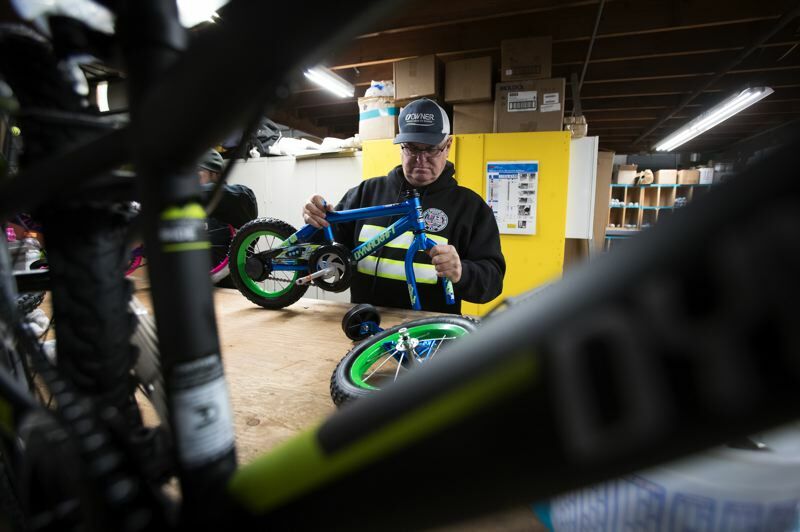 His claim as owner of the best two-wheeled ride might have some competition soon from the 260 children in the Portland metro area who'll receive bicycles donated by Crawford's Tigard-based company, Pioneer Waterproofing. 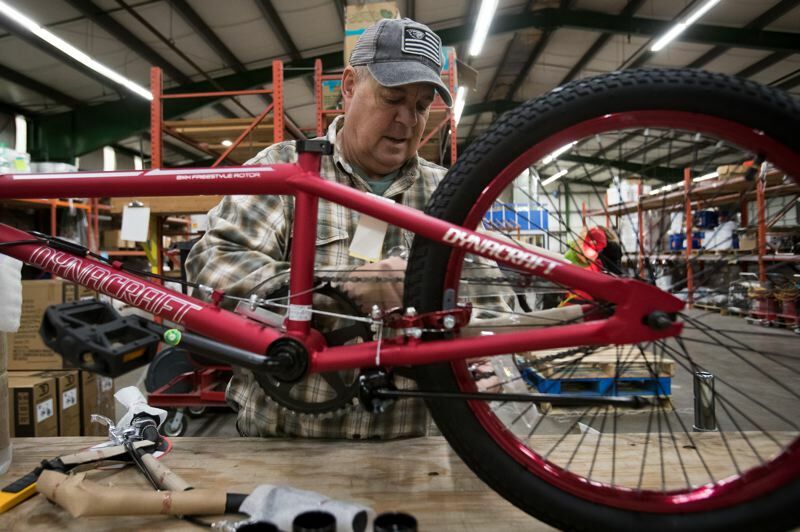 On a recent Saturday morning, Crawford and his family were joined by company employees and their families for a three-hour effort to assemble a brigade of bicycles that, once built, were headed for an annual toy drive coordinated by local television station KGW. 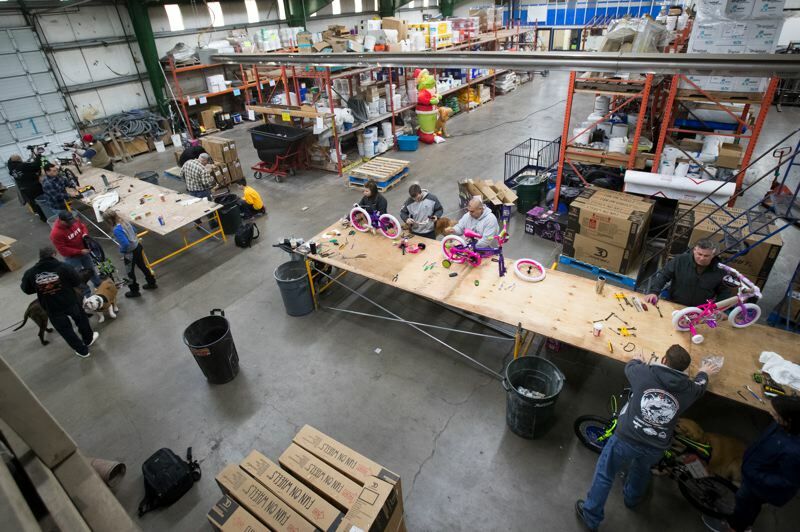 It's a tradition that started two decades ago and has since resulted in Pioneer providing a total of 4,800 bicycles for children in the Portland area whose families might not otherwise be able to provide them with presents this time of year. In the company's earliest days of holiday giving, employees used to help assemble and deliver food boxes. But Mike had always dreamed about buying old bicycles and refurbishing them to give to kids without two-wheeled rides, his wife, Libby Crawford, said. In 1998, as the holidays neared, he decided to call some local contractors and company partners to see if they would help purchase some bikes. That effort resulted in donations totaling $13,000, enough money for Crawford to go out and buy about 100 unassembled new bicycles. His employees agreed to help build them, and an annual company event was born. The company has only missed one year, when supply logistics kept Pioneer from being able to obtain bicycles, Libby Crawford said. The bicycle building event is something the employees look forward to every year, according to Mike Crawford. "They start asking me about it a couple of months before," he said. These days, the company puts up the money — about $20,000 each year — to buy as many unassembled bicycles as a local Fred Meyer can provide. The Crawfords make sure there's an even split between models for boys and girls, as well as a range of sizes, from "gliders" without pedals to bicycles with training wheels to models for older children. The routine is the same every year. Boxes containing unassembled bicycles are stacked up in the back of the company's warehouse on Southwest 72nd Avenue. 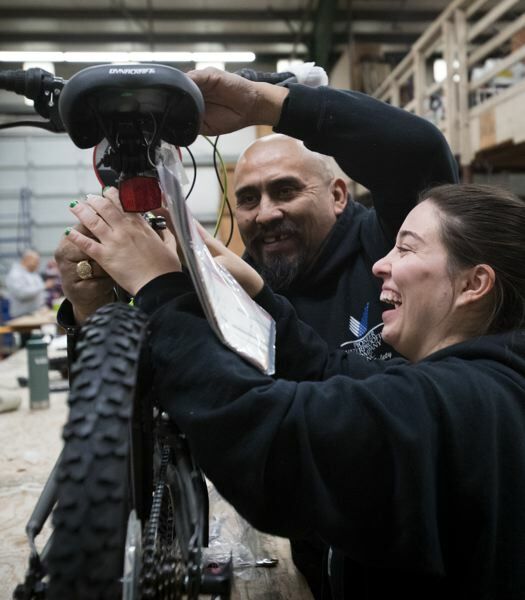 As employees and their spouses, partners and kids — and a few pets — arrive, they find a spot at one of three tables where bikes are assembled. At a fourth table, a smaller crew tests nuts and bolts and screws to make sure everything is secure before filling tires with air. parking duty went to Robert Gumbert, 7, who joined his dad, Lee, for the morning event. While this was Robert's first year at the bike build, Ciearah Beck is a veteran bike builder. Her dad, Gary, first brought her to her first bike build when she was 4 years old. This year, the 16-year-old junior at David Douglas High School brought a friend, Alessandra Burnette, a 15-year-old sophomore at the school. "I like the way it makes me feel, knowing that kids are going to get bikes for Christmas," Beck said. Brad Cram, a project coordinator and 37-year employee at Pioneer, has been participating in the bike build since the first year it was held. "Haven't missed one yet," he said as he set a pair of handlebars in place. This year, Cram had some company. While his son Zach, who also works at Pioneer, and Zach's fiancee Caitlin McBee worked on a bicycle, Cram received a helping hand from his grandson, Owen. The 1-year-old boy offered his grandfather a steady supply of wrenches and other tools lying nearby on a worktable. That sense of family is something that Pioneer has become known for, Libby Crawford said. The Crawfords' daughter, Sara, 25, recently moved from a position in the Pioneer Waterproofing office to a role as the company's first female project manager. Her brother, 14-year-old Thomas, will begin working summers at the company. And while sister, Kate, 23, doesn't work at the company — she has a career in education — she joined Pioneers employees who gave up their Saturday morning to put the bicycles together. "We have good people here," Libby Crawford said. "We all support each other. This is just how we share that with others."